There is a pound of spaghetti sitting in the depths of my stomach…making me all happy and cozy and little sleepy. The sleepy bit might be because I have been up since 5am. Or it’s the carbs. It’s a toss-up. Either way, I am overly content…as my dad would say, ‘if I were any better, I would be two people’. What is aiding in my contentment might be the roaring fire and endless amounts of Grey’s Anatomy on Netflix. Did I mention pjs and a cat sleeping on my feet? Cozy comfort town … that is where I am livin’ it up. On a Saturday night. Maybe I should lie and say it is Tuesday night, but I am not a good liar (or poker player). I love simple Saturday nights (see previous post). I had my Saturday night out on Thursday. I met up with 2 friends (who happen to be married) for a dinner date. Mel and Todd are pretty terrific and time spent with them always leaves me giggling, which leads to a good belly laugh, and all out cackling. OK the cackling is all me…I can’t help it. Sapore was our destination of choice, a tiny restaurant that we have been meaning to visit for many months. It is owned/ran by Loretta Paganini. Attending her cooking classes is one of our favorite girl’s night out events. She is possibly the cutest little Italian women ever to exist. She is full of knowledge and ready to share…we are total groupies. The restaurant is tiny…maybe thirty seats in all and is only open Thursday – Saturday. Reservations only. The menu changes with the seasons (as all should but don’t) and your food is cooked to order (i.e. fresh). The menu is teeming with Italian dishes that literally made me swoon, out loud. While I went with the focaccia- crusted chicken smothered in tomato sauce, fontina cheese, and olives…I haven’t been able to stop thinking about the pastas. Fresh pastas. Mama mia! 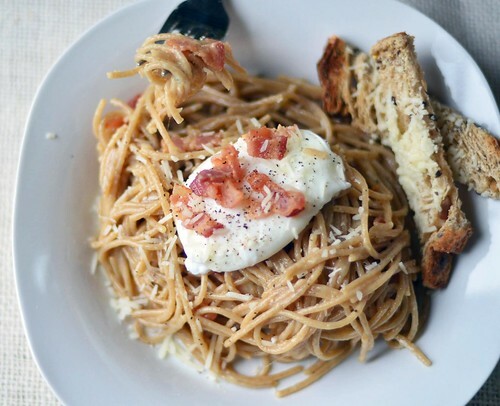 I can’t wait to try her Fettuccine Alla Carbonara….which they top off with a poached egg. Genius! I LOVE a good poached/fried egg atop of anything, ranging from hamburgers to pizza…I hope it’s not a phase. And that brings us to my Saturday night. Check out that full circle. 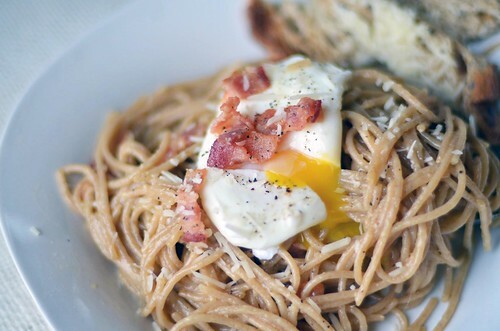 Carbonara = bacon and eggs Italian style. And instead of toast as the carb, we have pasta people. Pasta!! Seriously!?! Seriously?!? ( in my best Meredith Grey’s voice…not a word). This dish comes together quickly…which means that all ingredients must be prepared and prepped before the stove is turned on. Thankfully there aren’t a ton of ingredients. We are talking pasta, olive oil, garlic, cheese, eggs, bacon, and bit of white wine. Simple ingredients. Nothing scary. Totally doable. OK a little bit of scary…raw eggs are stirred into hot pasta, but I swear it cooks the eggs. And if you choose to top the dish off with a poached egg, well you will have to poach an egg, which is super simple…pinky swear! Just watch this video – total proof (and her laugh is great!). And trust me, the end result doesn’t have to look pretty. We are home cooks not Wolfgang Puck…plus, I have watched Julia Child make poached eggs on PBS and some of her eggs were ugly. Just make the poached egg, you will be happy you did. Crack egg into a separate bowl or small tea-cup. Bring a large saucepan of water (a few inches in-depth) to a boil. Add salt to boiling water (about 1/2 to 1 teaspoon). Once the water is boiling, take a slotted spoon, and stir the water in a circle creating a whirlpool like effect. Gently pour egg into the center of the whirlpool. Cover saucepan with a lid (or a cookie sheet, I have used both) and remove saucepan from heat. Let sit, covered, for about 3 minutes (very runny) to 5 minutes (less runny). Gently remove poached egg from water with a slotted spoon and drain excess water. Place egg on a plate, cover loosely with tinfoil (to keep warm) and set aside. 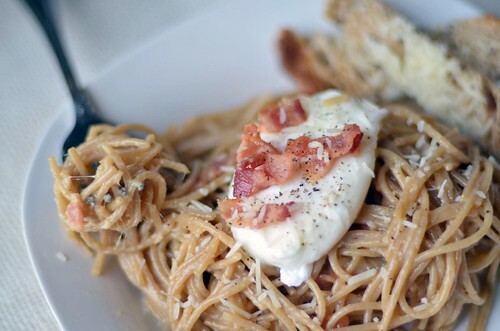 Whisk together 2 eggs and parmesan cheese. Set aside. But keep it close. Bring a large pot of water to a boil, add salt (1/2 to 1 teaspoon). Place dry spaghetti into boiling water and cook for 8 minutes until al dente. Reserve 1 cup of pasta water. Drain pasta. While the water is coming to a boil and the pasta is cooking, heat 2 tablespoons of olive oil over medium-high heat in a dutch-oven or large saucepan with high sides. Add smashed garlic and saute garlic until golden brown. 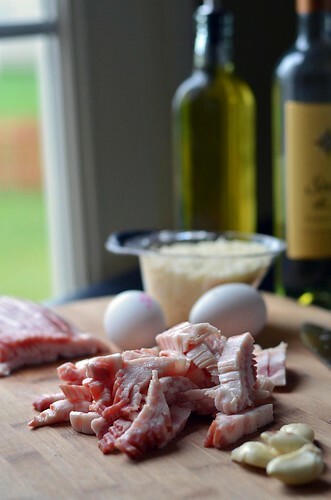 Once browned, remove garlic and discard. 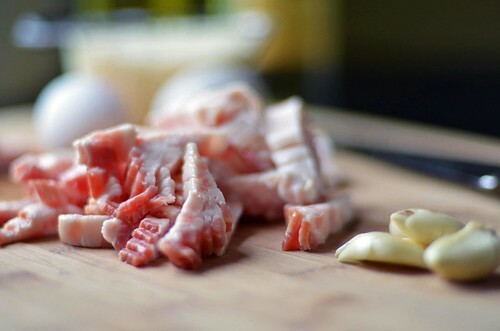 Add diced bacon to pan and cook until bacon begins to crisp around the edges ( 5-7 minutes). Stirring occasionally. Add white wine to pan and let it cook for about 2 minutes. Remove the pan from heat. Add cooked spaghetti to pan and toss to coat with bacon wine sauce. Pour in the egg/cheese mixture and stir vigorously until the egg is incorporated and the cheese has melted. Adding a bit of pasta water if a little thinning agent is needed. Make sure to stir quickly, you do not want scrambled eggs. The final dish will be thick and creamy and cheesy. Top each serving with a poached egg and a pinch of freshly ground pepper. Your poached egg can be rewarmed by placing it back into a bowl/pan of warm water for a few moments and then removing it and draining excess water before serving. Doesn’t take much. Serve immediately with a side of toast…because whats one carb without another?